What I enjoy most about Christmas, aside from the cookies and rum balls, are the traditions that come with it. As a kid, I would make my Christmas list using the Sears catalog as a guide. SN: the Sears Company came out with a phonebook sized “Wish Book” every holiday season. While it had pretty much every item that Sears offered, from sewing machines and lawnmowers to industrial grade brasseires and power tools, that tome was also chock- full of toys and games. I can clearly remember lying on the floor of my room, the Wish Book’s pages dog-eared from where I had spotted the toys I hoped to get. After a Christmas Eve dinner of Chinese food, my parents would let me open one gift before bed. As I got older, although the Sears catalog stopped coming, my wish list was still pretty long. The Chinese food dinner remained and was followed popping The Long Kiss Goodnight into the VCR. Since M, C, and V burst onto the scene, our traditions have changed. 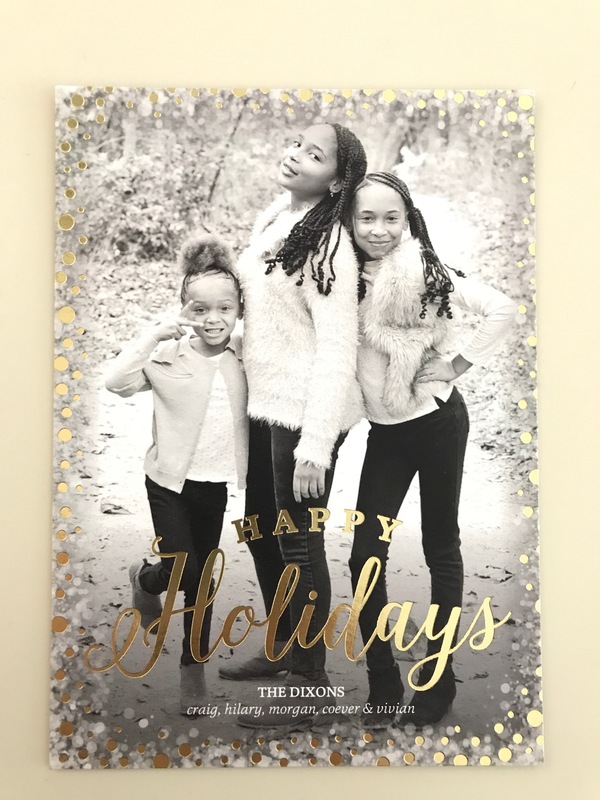 There’s an annual holiday card. There’s the letters to Santa. There’s the decorating of the tree while we listen to Mele Kalikimaka and the Hubs favorite, Christmas in Killarney. There are matching Christmas dresses made by Grandma and advent calendars. We still have Chinese food on Christmas Eve and the girls get to open a gift before bed. 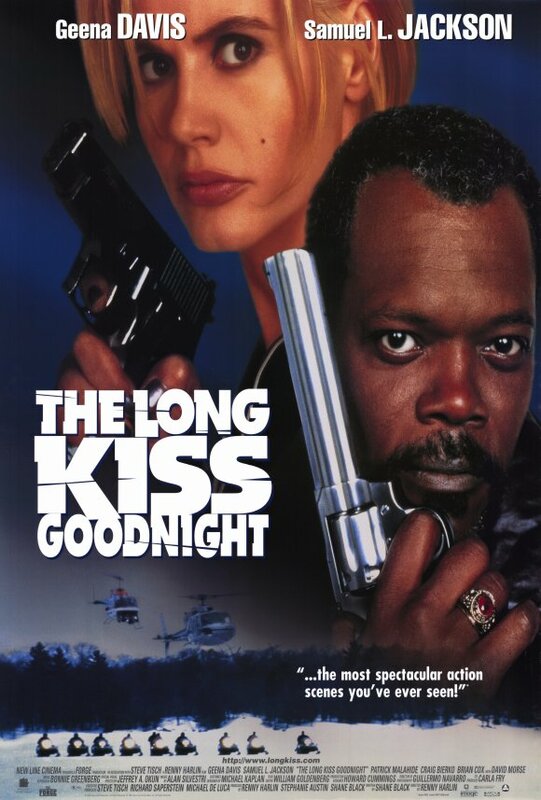 The Long Kiss Goodnight has been retired in favor of whatever Christmas movie is on. I’ve tried to get The Christmas Story or The Grinch or even A Charlie Brown Christmas into the mix, but none of the girls are interested in those classics. One year, I wanted to start an annual reading of Christmas poems from the book “Under the Christmas Tree”. They threatened to call CPS if it even looked like I was going to spout off some iambic pentameter. On Christmas morning, there’s egg nog (lots of egg nog). 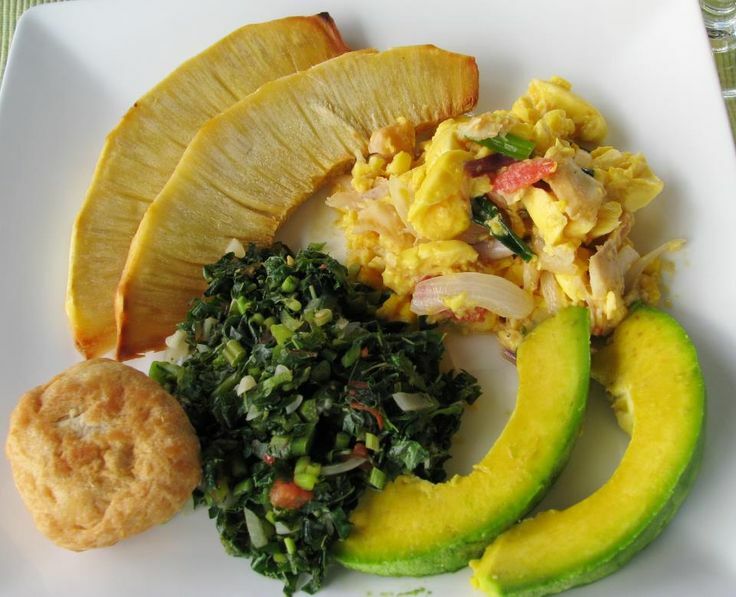 As a nod to the Hubs side of the family, we have a traditional Jamaican breakfast made by the Hubs. Even though this Christmas will be different for us, I’m not giving up on the traditions. The Christmas cards went out. The Christmas lists have been made and shared with the grandparents. We’ve drunk copious amounts of egg nog, popped open the doors on the advent calendar, and danced around to Bing Crosby. There’s even a wreath on the door. First let me say, I had written this thoughtful, eloquent post over the holidays while we were running to and fro between the homes of family members. If I’m being honest, I didn’t really set aside some time to reflect. It was pretty much on the fly, literally typed on the WordPress app on my phone. I wrote and wrote. I added a few pictures. I didn’t even hit save. I just hit publish. I went about the rest of the holiday thinking I had blessed you all with some delicious Hilary with One L bon mots that would carry you into the new year. When Life and the the remnants of 2015 started slapping me around like I left coal in their respective stockings, I was glad that I had written a Christmas Eve post. I felt that I could cruise into 2016 feeling that I had snapped the lid on writing in 2015 in a definitive way. That post never got published. That post never got saved. That post, when I pulled it up on my laptop, gave me a flirty little wink and then disappeared into oblivion. I didn’t have chance to screenshot it to salvage the opening lines. And given that we are almost a week into the new year, that the 2015 holiday season was a wine soaked, cookie stuffed, snack infested, almost bacchanalian loaf about doing nothing but whatever we felt like type of holiday season. . .I have no idea what I wrote. I do recall one thing, though. I mentioned, somewhere in the depths of those witty paragraphs, that I’d done a bit of growing up over the last few weeks. I’ve fully come into my adulthood. While I was writing the now vanished Christmas Eve post, I didn’t really want to get into the minutiae of how I came to that realization. I promised you that I would address in future posts. That was what this post was to be about. 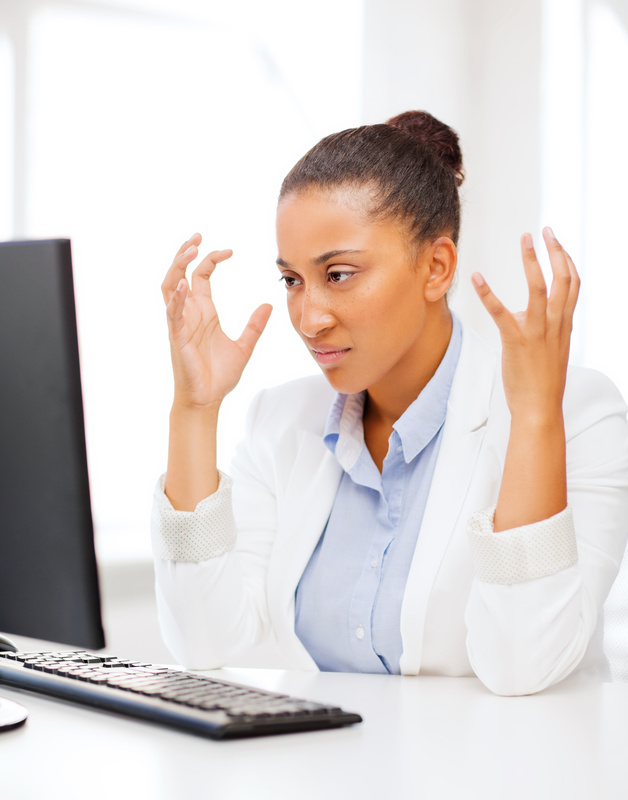 Instead, it’s just me with my hat in my hands, asking you to be patient while I bang my head against the wall for not saving my work (again) and work on stacking up my experiences like a Jenga tower of life lessons for you to pull and learn from. It’s only the 6th day of 2016. Not to late to switch the resolution. So much for flossing in 2016. This homegirl needs to save her work. My Thanksgiving wish for you. . .
May you be called to the table on time. May the blessing be powerful, thoughtful and delivered by someone who believes in “short and to the point”. May your plate be heaping with delicious food you didn’t have to prepare. May the meal be plentiful enough for seconds and to-go plates. May your turkey be moist and flavorful, may your sides be warm and abundant, and may your tea be sweet and your cider have bite. May many hands make light work of clearing the table, and may yours not be among them. May your pants have enough elasticity to accommodate multiple plates without having to undo the button. May the football games be exciting, may the board games end in smiles instead of tears, and may the Wi-Fi be password free where ever you go. May your IG feed make you smile, may your Facebook feed make your laugh, and may your Snapchat feed make you glad they don’t last very long. May family and friends fondly reminisce about Thanksgivings past, enjoy the present with a grateful heart, and look to the future with hope. 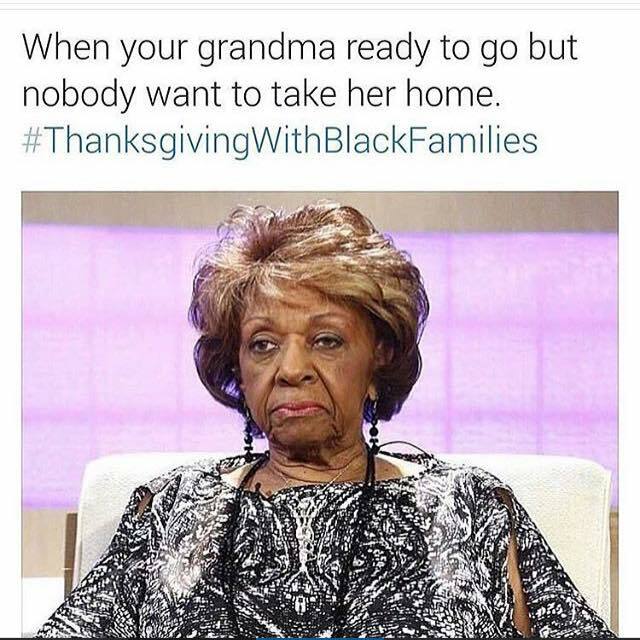 And above all, may your grandma get home when she “ret ta go”. 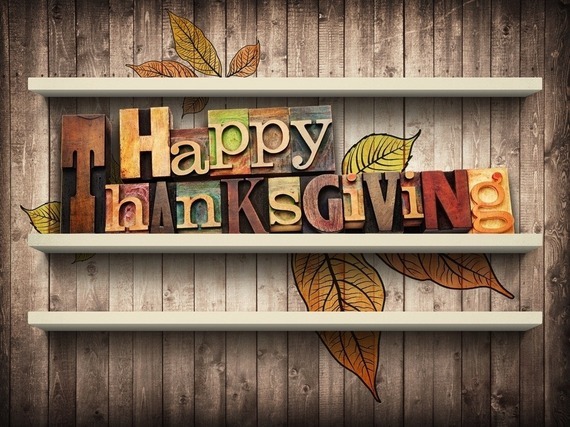 There is always, always, always something to be thankful for, a sentiment to keep in mind not only for today but always. I’m grateful for the blessings that are my husband, my children, my family and my friends. I’m grateful for my readers and my followers. There are too many blessings to count, but know that I will take a moment today to reflect upon them all. Thank you for letting me share a piece of the holiday with you! Well, the day is drawing to a close, but the activities continue in full effect. Certainly tummies are full, shoulders are sunkissed and arms and legs are getting bathed in bug repellant as families and friends gear up to grab some grass and watch some fireworks. We had a leisurely day in these parts. We went for a walk, M and C scooting and biking as the Hubs and I took turns motoring V along on her push trike. We had out cook-out at lunch time: hot dogs, hamburgers, Salsa Fresca and chips. V napped, we lazed about before embarking en masse to Target for a sprinkler and then Whole Foods for some yummy dinner bites. I can never leave Target without coming out with more than I went in for. I know I’m not alone in that, but why? Why does that always happen? The Hubs is immune to Target’s siren song, but when we went into Whole Foods, he turned into Paul Prudhomme. As our cart filled with fruits, veggies, cuts of meat and fish, he quipped, “We’re going to feel this in our whole wallet”. Oy! Never go grocery shopping hungry. You come home with stuff you know you shouldn’t be eating (Hello, bakery bag of snicker-doodles. Nice to see you, quart-sized container of chocolate dotted trail mix) and/or come home with more food that you have room to store. Yes, those are cherries and grapes are just going to squat in the sink until we can find some real estate for them. Dinner was a smorgasboard of options. Shrimp grilled two ways for M and C. Pizza for V. Crabcakes and Baja Crab bites for the Hubs. Steak and fries for me (who’s a happy girl?). As for dessert? I had my eye on some cupcakes at Whole Foods — you can’t go wrong with cupcakes, but in an unmatched feat of strength, I left them behind. We’ve got Cherries, grapes, watermelon, strawberries. Add some ice cream or cool whip, and you’ve got a yummy, relatively health after dinner option that touches on patriotic. Of course, it doesn’t get any more American than apple pie. While I didn’t whip one up for today, just thinking about it has given me a taste for that crumbly, butter, sweet goodness. 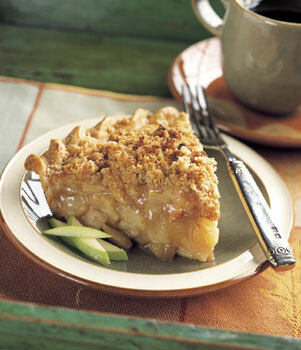 A thick layer of finely textured crumb topping crowns a tall mound of apple filling. Mix flour, salt, and sugar in large bowl. Add butter and shortening; rub in with fingertips until coarse meal forms. Mix 3 tablespoons ice water and vinegar in small bowl to blend. Drizzle over flour mixture; stir with fork until moist clumps form, adding more water by teaspoonfuls if dough is dry. Gather dough into ball; flatten into disk. Wrap in plastic; refrigerate 30 minutes. Position rack in center of oven and preheat to 400°F. Roll out dough on lightly floured surface to 12-inch round. Transfer to 9-inch-diameter glass pie dish. Trim overhang to 1/2 inch; turn edge under and crimp decoratively. Refrigerate while preparing filling and topping. Mix all ingredients in large bowl to coat apples. Blend first 5 ingredients in processor. Add chilled butter cubes; using on/off turns, cut in until mixture resembles wet sand. Toss filling to redistribute juices; transfer to crust, mounding in center. Pack topping over and around apples. Bake pie on baking sheet until topping is golden, about 40 minutes (cover top with foil if browning too quickly). Reduce oven temperature to 350°F. Bake until apples in center are tender when pierced and filling is bubbling thickly at edges, about 45 minutes longer. Cool until warm, about 1 hour. Serve with ice cream. Valentine’s Day is on Friday and with the coming Snow-magedden, it looks like we’re giong to be home boudn for a bit. I have been trying to stockpile activities for the girls so that when the come back inside from their five minute romp in the snow, we can avoid tears (theirs and mine). 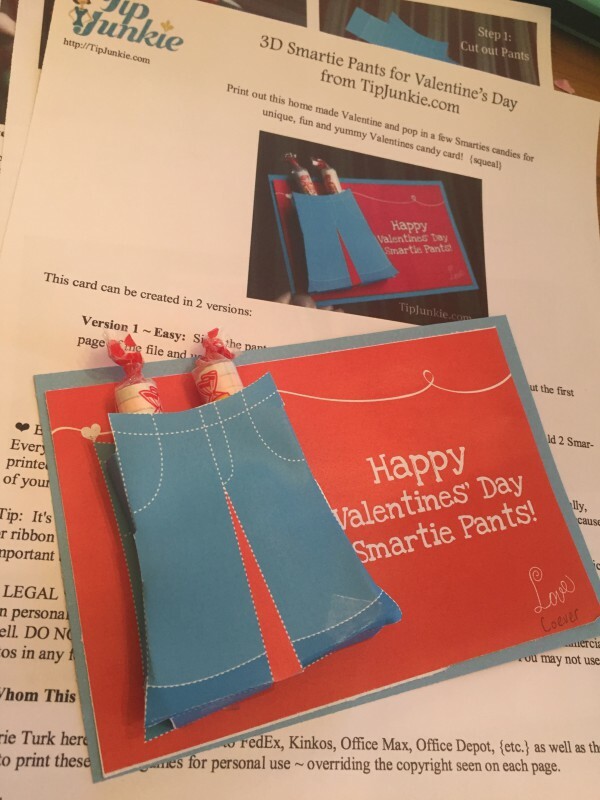 What I should have done was waited until the last minute to do their Valentine cards, but when have I ever waited until the last minute for anything? Never. 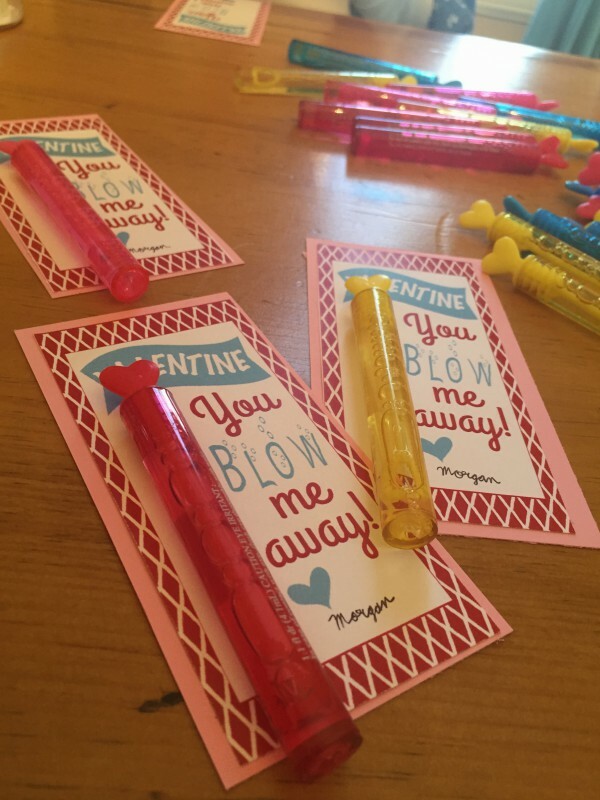 We did their Valentine cards during the Super Bowl pre-game show and I had been sitting on the idea and supplies for welllllll beyond that. When it comes to crafts, I like to do things that are fun, easy, and take up relatively little time. I spend a lot of time on Pinterest looking at ideas, but I’m not going to be making thumbrpint jam cookies from scratch using jam I made with my organic, hydroponic berries in my DIY 4×4 rubbermaid wheelie tub. I’m not that kind of DIY. I’ve got a glue gun, but no glue sticks. I’ve got tons of scrapbooking paper, a Fiskar’s straight edge paper cutter with a dull blade, and an old pickle jar full of multi-colored brads. Truth be told, I’ve got a decent crafting kit. 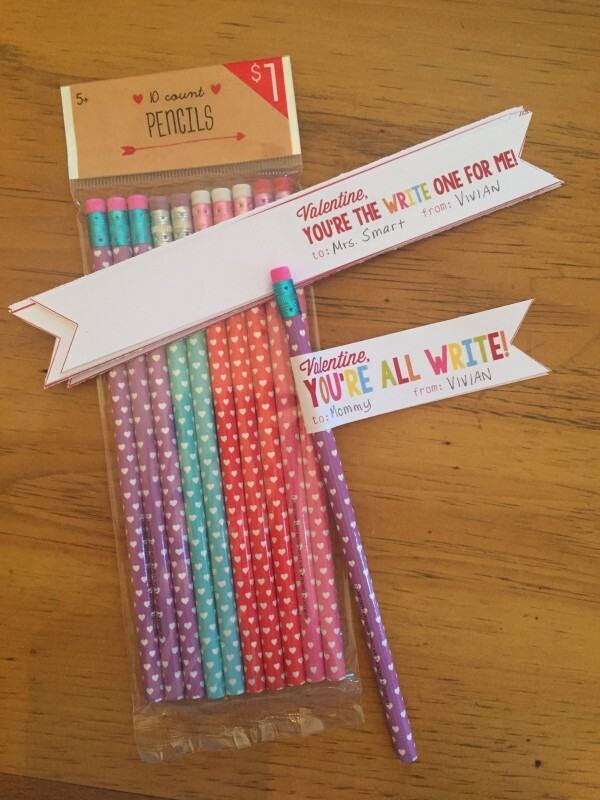 I can knock out some cute thank you notes if I’m ever in a pinch. When the Hubs coached C’s pee-wee soccer team, I made the team little paper ribbons. I didn’t spend more than $7 on supplies and the whole thing was done and cleaned up in about 90 minutes. My kind of craft. Since the girls have been attending school, they haven’t really had to do cards for Valentine’s Day until M hit the first grade. In kindergarten and pre-k, it was okay if you wanted to do something, but you didn’t have to. 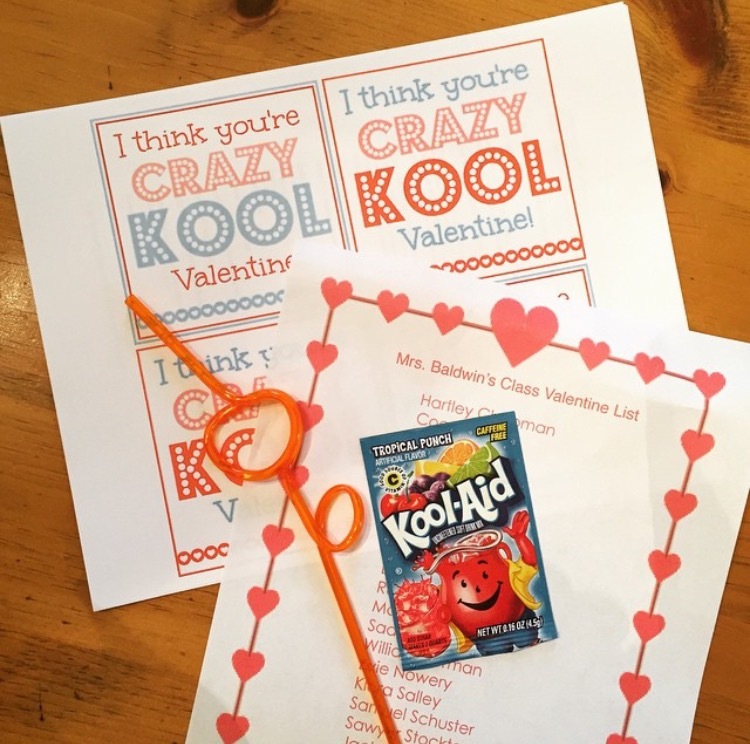 I probably sent in some kind of treat for the class party, but at that time, they were too young to really get the gist of handing out Valentine’s. Come first grade, though, the stakes are amped up and I gladly accepted the challenge. In truth, this project is pretty simple. Step 1: Find a willing participant. Once I showed Morgan what I had in mind, she practically threw my camera at me and struck a pose. 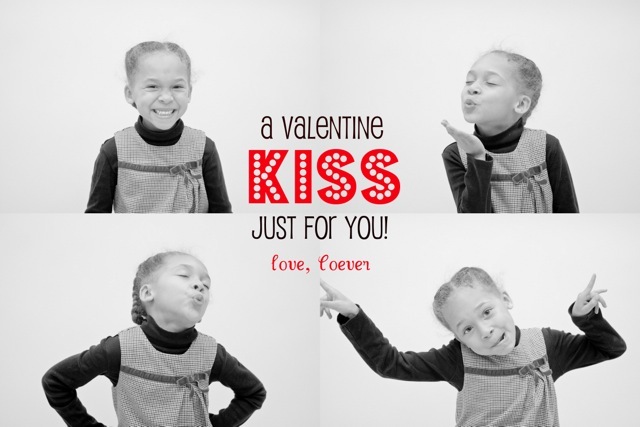 As for C, well, she said she wasn’t handing out Valentine’s in pre-k, so she became my (un)willing assistant. 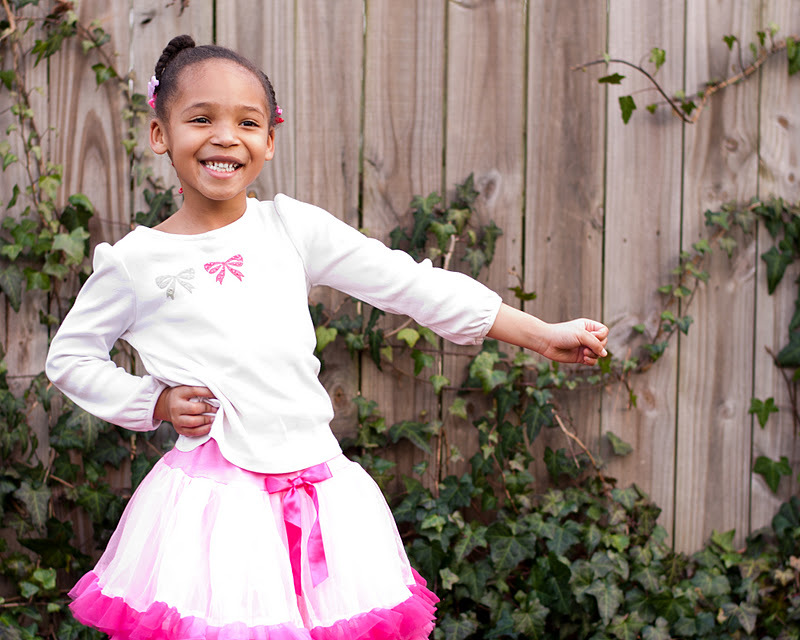 Step 2: Have your subject pose holding their arm outstretched, their hand in a fist. We tried a couple different poses and decided to use these two. Step 3: Upload the photo to your editing software of choice and add your desired text. Step 4: Print out the images using 4×6 dimensions. Step 5: Punch a hole or make a small X above and below the fist so that the stick of the lollipop slides through the card. I’d also put a piece of tape on the back so that the lollipop doesn’t slide out. Forgive the quality of these images. I was trying to make dinner, take the picture, stop the girls from eating the lollipops, and bouncing from foot to foot because I needed to go to the bathroom, but of all the things going on, that one always takes last place. I printed these out on regular paper, but I would advise using cardstock or photo paper. 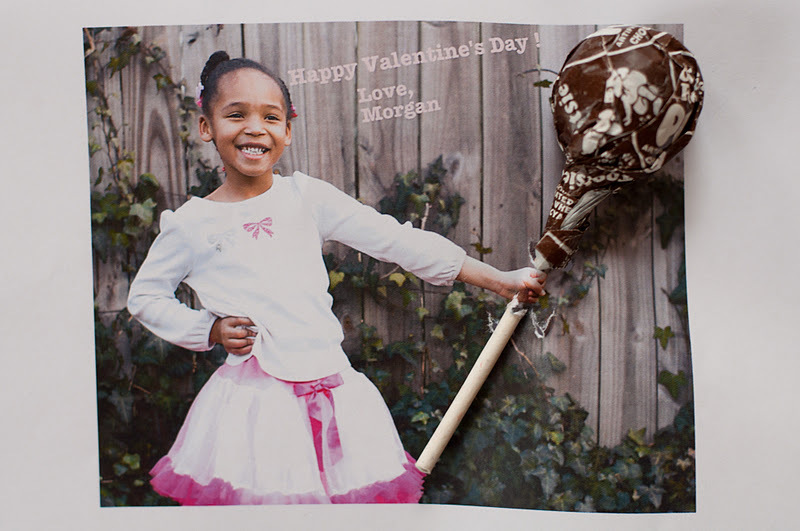 The weight of that kind of paper is more durable and less likely to buckle under the weight of the lollipop. I’m also considering uploading the prints to one of the many online photo websites (i.e. Snapfish, Shutterfly, Kodak Gallery) and letting them do the printing and cutting. And guess what? In 5 steps, I have justified spending countless hours on Pinterest finding things to demonstrate my prowess as a craft-master. Everybody wins! 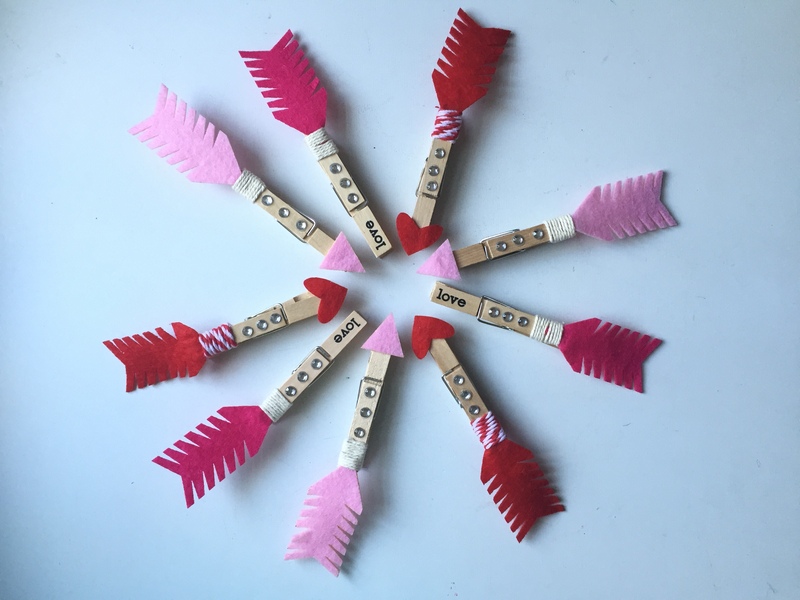 For Valentine’s Day 2013, I went back to my Pinterest board and scrolled through what had been Plan B for the previous year. Basically, you take a bunch of funny pictures of your little person. 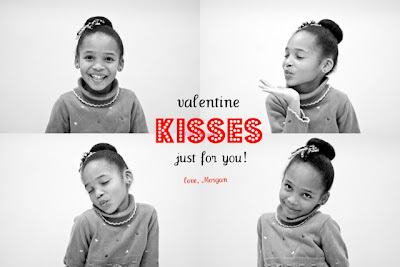 Using a program like Picasa or Google +, you can collage the pictures and add text. 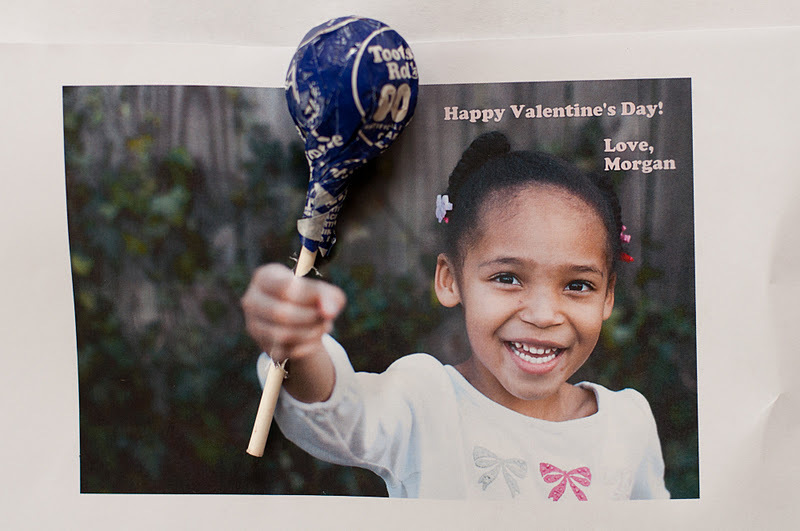 Print out the collages on regular paper (or get extra fancy and print them on cardstock) and affix them to Hershey Kiss filled baggies. Ta-Da! Done and done. I think the most time consuming part was the picture taking and the collage making. What I love about this one, besides the ease with which it is made, is that the photos totally capture the girls’ personalities. The bottom right picture for each of them is the pictorial representation of who they are through and through: Captain Crazy and Sweetness. 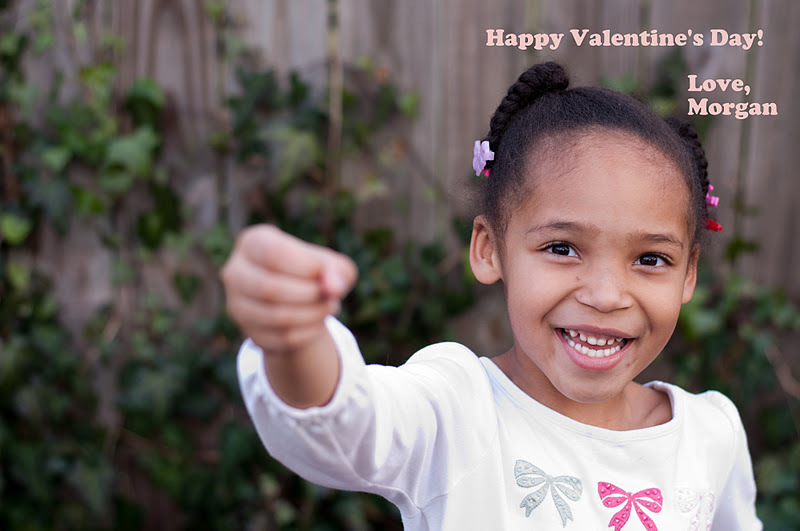 So, you know I’m at it again for this year, despite having read The Bloggess post about Valentine’s Day Under-Achieving. That just simply re-enforced my Type A commitment to this foolishness. I’ll leave you with the link here. This year, I decided against using photos (don’t want to saturate our audience) and switched it up. 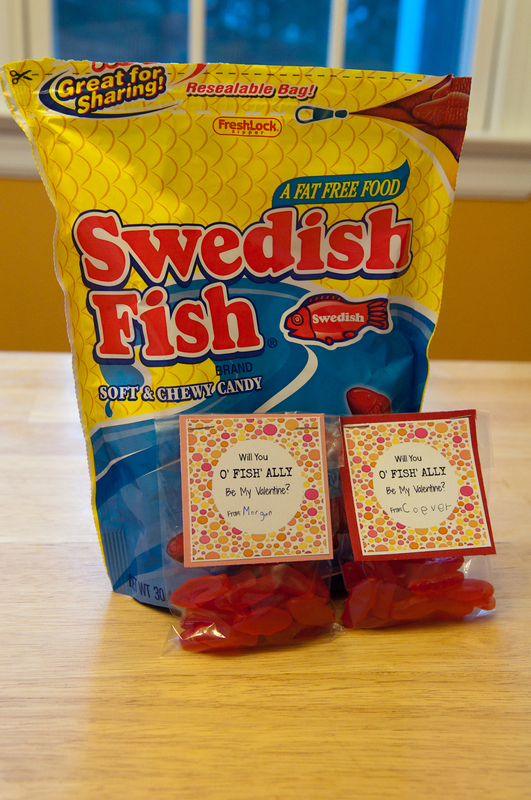 M & C want you to “O’ FISH-ALLY” be their Valentine! Again, this was super easy. The hardest part was getting them to agree on what kind of fish to use — Goldfish or Swedish Fish and then trying to get the fish in the bags instead of their gaping mouths! I printed out the little sign from a download and stuck it to some card stock to give it some weight. We filled the bags with about 20 fish and stapled the card to the bag, sealing it off. The greatest amount of time was spent gluing and pasting, but again, all told, the whole things probably took an hour and a half. If the snowfall is anything like what they’re predicting then I had better get back on Pinterest to start planning for next year’s card. We can probably knock it out between the first trip out in the snow and breakfast! I don’t usually weigh on when news pundits make gaffes. By the time I’m caught up on the latest attack of foot-in-mouth by some talking head, it’s because I saw it on SNL on Hulu a week after the fact. This time, however, the story to which I’m referring is a gift that keeps on giving: Megyn Kelly of Fox News and her insistence that Santa (and Jesus, but I’m not touching that) is white. *le sigh* and full body eye roll so intense, I now have six pack abs (there’s a Christmas miracle !). The social media outlets all but imploded as tweets, memes, and Vines exploded, thoroughly trashing Kelly. Kelly trying to backpedal defend herself, tried running the “race-baiting” flag up the pole, heartily waving it while touting that the whole thing was “just a joke”. Sorry, Kelly, but there’s always truth in humor. And guess what? Your truth came through loud and clear. Look, if you think that Santa — who for the record is a mythical concoction — is white, good for you. In my family, we believe that Santa is Black. I have gone to great lengths to maintain this belief for my children, searching for a Santa who looks like us for quite some time. Six years ago, I was desperate to find a Black Santa for the children. While M and C never flat out asked me if Santa was Black, I never said he wasn’t. We’re Black, ergo, Santa would be, too. As it turned out, finding a Black Santa was as elusive as a same day reservation at the French Laundry. It shouldn’t have been that way, especially considering the rate at which society is becoming more and more multi-ethnic, but there it is. At that time, in the holiday department in Dillard’s at the MacArthur Mall, there was a tree that was decorated with all Black Santa’s, Black Ballerina’s, and other Black-centric ornaments. Right after Thanksgiving, my mother stumbled upon that tree and excitedly told the clerk on the floor how wonderful the tree was. She then went on to ask where and when the Black Santa would be coming to town. The clerk, who was also Black, said something like, “Blah, blah, blah, there isn’t one”. Not one to be dissuaded, my mom, who I think was Nancy Drew in a former life, set out to find one. She said she was doing it for her granddaughters, but I know deep down, she wanted to see Black Santa, too. Fast forward to the 1st of December. 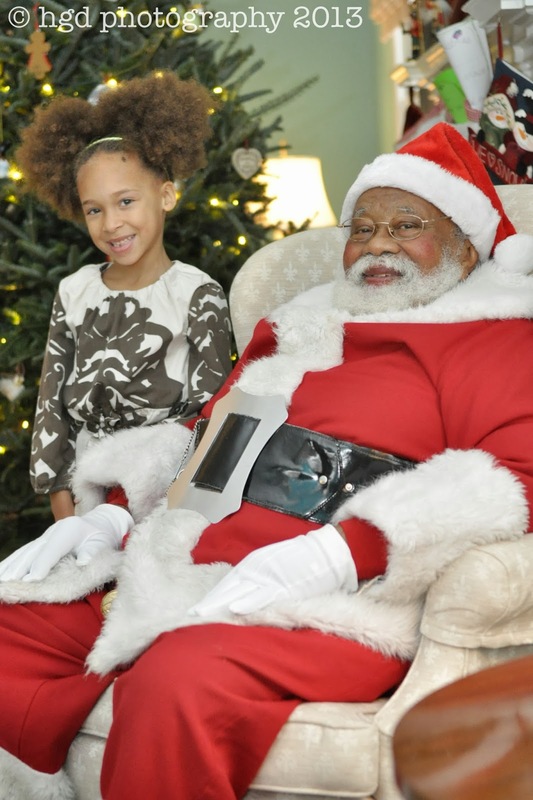 Evidently, there WAS a Black Santa, and he was going to be at the Newsome House in Newport News on December 8rd — FOR ONE DAY ONLY. Sadly, we didn’t make it to that event that year. I really wanted to make this Santa thing happen for the children, and even went so far as to suggest to the Hubs to rent a Santa suit, dress up for our girls, snap a few pics and then return the suit!! Or keep it for next year, whatever. Shoot, if word got out that we had a Black Santa, consider Christmas paid for! Yeah, that didn’t happen. The following year, I was determined to make a visit with a Black Santa happen for the children. As soon as October rolled around, I put the Newsome House on speed dial, constantly pestering them for information about the Soulful Christmas Celebration. When the information was released, I was told that there would be a Black Santa present and the Soulful Christmas Celebration would only be for Saturday during the month of December. Well, I made sure that we were there like stripes on a candy cane. And yes children, there was a Santa Claus that looked like us! There were some other things that went down at the Soulful Christmas that undercut the Santa, but that’s a post you can revisit here. I was disappointed as to how that experience turned out for the girls. I wanted to find a legit Santa to which they could relate. I stopped referring to Santa as “Black Santa”, because it implied that there was more than one who was of another hue. I impressed upon the girls that Santa is/was whatever the family imagines him to to be. Plain and simple. For us, Santa looks like a member of our family. Nowadays, when the girls see another Santa out and about, it doesn’t phase them. They gladly take proffered candy canes and chucks under the chin. They smile coquettishly at any jolly, giant in a red suit, young or old, thin or fat, white, brown or in between. Highly sought after presents are on the line, amirite? *ahem* side eye at Megyn Kelly. I’m not going to sit here and give you a lecture about the origins of Saint Nicholas, Santa Claus, Père Noël, Papa Christmas, Krampus, Pai Natal or Kris Kringle. Different parts of the world celebrate this time of year differently, but the fact remains that the celebrations are unique to those individuals. None of us have the right and should never have the umititigated gall to tell another what they practice and believe is wrong. Of course, people do it and I could point to the Pandora’s box of political behavior throughout the course of history, but it’s Christmas. I’m trying to keep things light. My older girls are at an age when their belief in fairy tales and childhood folklore is is tenuous at best. I will do whatever I can to keep the magic alive. When they ask me if I believe in Santa, I don’t hesitate to say yes. When they ask me why there are so many different looking Santas, I tell them that Santa is the embodiment of good will, caring, love, and the best parts of every family. A few week-ends before Christmas, Santa came to town and sat in my living room looking very much like the best parts of my family. I do believe in Santa Claus. I do, I do, I do.